The Common Ground Free Store will be open Saturday, Nov. 25 from 9:30 to 11:30 a.m. to serve a warm meal and provide take-home bags of food to those who might go without a meal between Thanksgiving Day and Monday. 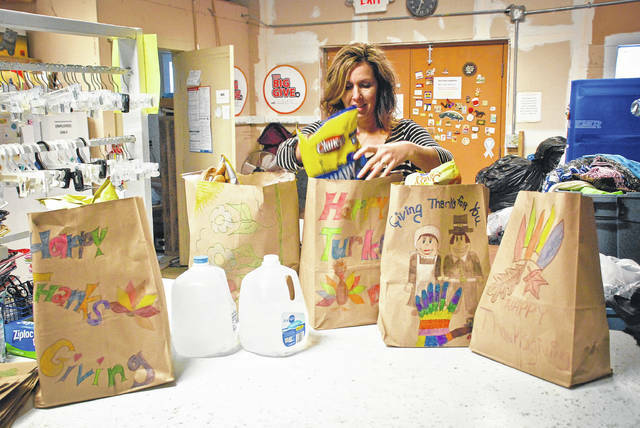 Executive Director Sharon Griner fills bags with donated food items. The bags were decorated by women from the Horizons Program at the Ohio Reformatory for Women. Common Ground Free Store Ministries wants to make sure nobody goes hungry during the holiday season. Executive Director Sharon Griner said normally the Common Ground Free Store is closed the Saturday after Thanksgiving, but not this year. Griner said this is the first year for the store to be open the Saturday following Thanksgiving. She said if one family was out there last year, then there were probably others as well. The charitable organization will open the Common Ground Free Store, 193 E. Central Ave., Delaware, from 9:30 to 11:30 a.m. on Saturday, Nov. 25 to serve a warm meal and provide take-home bags of food for those who need help. Griner said the bags of food will provide a meal over the long holiday weekend for those who might otherwise go without. She said volunteers will fill brown paper bags that were donated by the Horizons Program at the Ohio Reformatory for Women. The women in the program decorated the bags with traditional fall scenes, turkeys, pilgrims, and religious symbols. Some of the bags feature a mixture of Halloween, Thanksgiving, and Christmas scenes. Griner said Common Ground’s store manager works with the women who donated the bags. Griner said Terra Nova Church directs the outreach with help from Highpoint Nazarene Church and Delaware Grace Brethren Church. Once the Common Ground Free Store finishes up with the Thanksgiving weekend volunteers jump into their annual event on the first Saturday of December, Miracle on William Street. Griner said the William Street United Methodist Church is transformed into a magical holiday house. She said the event features cupcake decorating, live music, gift wrapping, punch, and cookies. There is even a special visit from Old Saint Nick who brings his personal photographer for the kids to get a photo with Santa Claus. The annual event started in 2006. Everything is free. “It’s open to anyone who needs Christmas assistance that is not receiving help from any other organization,” she said. Griner said at the heart of the event is an opportunity to donate toys and gifts to local families in need who have children. Griner said if groups, churches or organizations would like to donate toys or gifts to needy families this Christmas, they should contact Jill Ignaszewski, volunteer manager, via email volunteer@commongroundfreestore.org, or online at https://commongroundfreestore.org/volunteers/. She can be reached at 740-417-1285.